Liz's Paper Loft: My Creative Time's October Release Day 2!!! Hello, I hope you are enjoying your week so far! If you haven't heard My Creative Time has done it again with the cutest stamps being release on Friday! If you haven't already seen what the other girls on the Design Team made yesterday, you really need to take a peek! I just know you'll be blown away! For today's project we are all featuring All Around Accessories! This set is SOOO CUTE! You can use them for layouts, cards, and so much more! I first stamped the santa suit on white cardstock, then used zig glue to fill in the area that I wanted red, then sprinkled the red glitter. Once dry, I did the same thing for the buckle with gold. Again when dry I used flocking for the fur areas. *disclaimer* don't look to hard other wise you'll be able to see where a little of the red glitter got on the flocking. Love how you used glitter and flocking instead of colouring(which i can't do at all) it really shows that you can use these stamps in different ways!! great card! love that music sheet paper!! So cute! 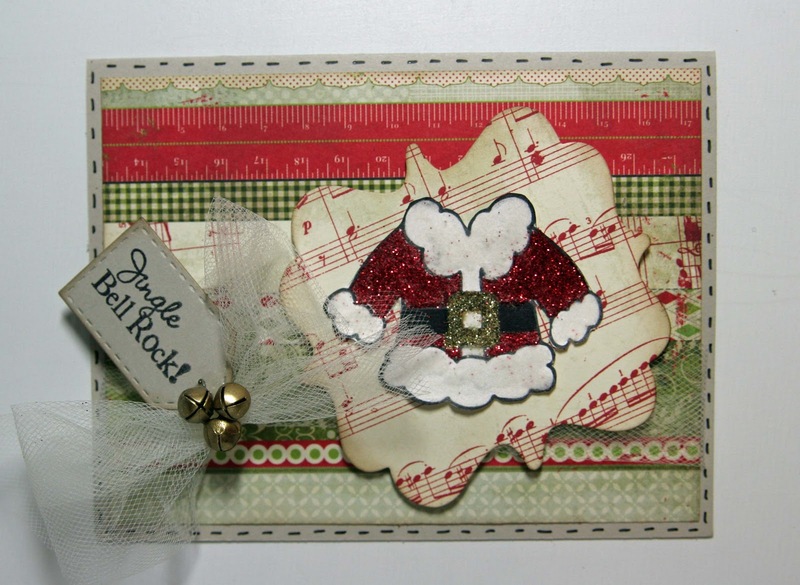 I love all the little accents on the card...the bow, the bells and the music paper! Wow, Liz! You rocked this! The glitter and flocking on the Santa suit are just perfect, and I adore all of your background papers!!! beautiful card....even without cricut! I love all of Emma's stuff! beautiful papers too! So cute! love the glitter and patterned paper! Great card! I love the vintage look of the papers! Great job! What a Great Card! Love all the details. TFS! Very cute--I like the music on the label. Wow I just love this card. That stamp is great and I just love the glitter. Adorable love the glitter, flocking and the paper you used. Like the musical background papers used on the die and that Santa's snowsuit is so cute OR maybe this is Mrs. Claus suit with all that glitter. Really like the dimension of your card. Pretty card. I love that you added the glitter. This set is really peaking my interest. This card is adorable. I love the music stamp and the santa jacket! TFS. Awww, cute little jingle bells :) I like to use the build a banner for a stamping spot too. Oh so pretty! Love the little jingle bells and the papers are perfect. This card is gorgeous! I love those papers you used. I think I bought this stack but haven't used it yet? lol that is sad. Really fun! And no Cricut! GASP. Beautiful Card Liz. Love the papers. cute love all the glitter! Absolutely loving this card. It is beautiful. The extra time you took to "create" your santa suit with the different glitters . . . FABULOUS. Love the jingle bells too! Wow. this is really cute. nice colors, and the santa suit is adorable! This Santa outfit image is the cutest! Love all the little details like the red glitter! Great job once again! This looks like a wonderful release! This is so freakin' cute! The music background goes so well with the card. Love it! Fabulous card! I think it's awesome that you made it without using your Cricut! I love your card, thank you for sharing!!!! So FUN with the red glitter! Great job. Very festive! This is absolutely adorable!! Great job I just love it! Awww I just love the paper you used! Lots of vintage christmas feel! I love the bells, adds a nice touch! This is fabulous and way too cute! What a beautiful card Liz! Love all of the details...bells...glitter...so AMAZING! Love this cute card, especially the sentiment with the actual jingle bells!!! ohh, so pretty! Thanks for sharing. Cute card! Love the glittery Santa suit. Thanks for sharing. loving the jacket. looks so fluffy and soft. This is so cute. I'm so in love with the Santa suit! Sweet card love the paper and the details ! The bells are such a fantastic little touch with the tool! Wow, great ideas. Super cute card! And the sentiment fits so perfectly. How did you get the Santa suit so blinged? I wish you had a video of this card so I could learn to bling out my stamped images like that. hint hint hint. This looks like a great stamp set...I love this holiday card- super sassy! Love the papers and that santa suit is soooo cute! Love all the details you have added! Great card! Love how the Santa suit turned out! !